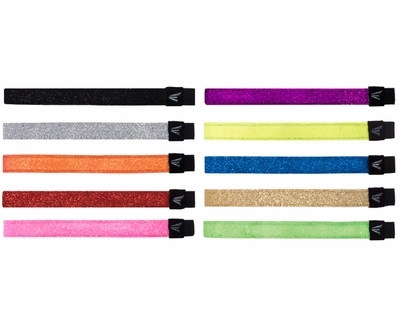 Accessorize your uniform with Easton Brand Sparkly Glitter Head Bands offered in 10 fun bright team colors. Glitterbands have a felt lining and elastic band in the back for comfort and fit. Easton Glitterband sequin headbands measure approximately 3/4" wide and 20" around when relaxed and provide a great one size fits most fit. These sparkly Easton Glitterband Headbands are covered in maximum sparkle sequins, and are great for girls of all ages. (see above - left to right; top to bottom) � Black, � Purple, � Silver (no longer avail. ), � Optic Yellow (no longer avail. ), � Orange, � Blue, � Red, � Gold, � Hot Pink, � Lime Green.